The market is volatile today, but you can still find steady dividend payers if you look hard enough. Here are three to put on your wish list. Finding stocks with yields above 5% is actually pretty easy. Finding stocks with 5%-or-higher yields that you might actually want to own in your portfolio, however, is a bit harder. But it isn't impossible to find such dividend diamonds in the rough. Three that might fit the bill right now are wood pellet manufacturer Enviva Partners, LP (NYSE:EVA) and healthcare real estate investment trusts Ventas Inc. (NYSE:VTR) and Welltower Inc. (NYSE:WELL). Here's a quick rundown on what you need to know about each of these high-yield stocks. Brian Stoffel (Enviva Partners, LP): I am definitely not the type of investor to chase after high-yield stocks. Oftentimes, a high yield is a sign that investors aren't big believers in a company's prospects -- which drives the price down and the yield up. I do, however, have one high yielder in my own portfolio: wood pellet manufacturer Enviva Partners, LP. The company's value is driven by the fact that European and Japanese power companies have a mandate to cut down on greenhouse gas emissions. While the future will likely be ruled by solar and wind, wood pellets provide a gap input that meets requirements. The long-term nature of the contracts -- the average contract length is 8.5 years -- provides safety for investors when wind and solar do, eventually, replace the pellets. Enviva aims to pay out $2.53 per unit this year -- good for a 7.9% yield at today's prices. A fire at one of the company's port terminals this summer has some investors worried about the company's ability to continue its high payouts. Investors considering buying shares should follow the coverage ratio -- anything above 1.0 means distributable cash flow is greater than the payout -- to see how sustainable the dividend will be in the future. Reuben Gregg Brewer (Ventas Inc.): The baby boom generation is now entering retirement at a rapid clip, which will swell the 65-and-older age group in the years ahead. This cohort uses medical services at an elevated rate. Which is why owning a healthcare real estate investment trust, or REIT, like Ventas is so enticing. That and Ventas' 5.5% yield. 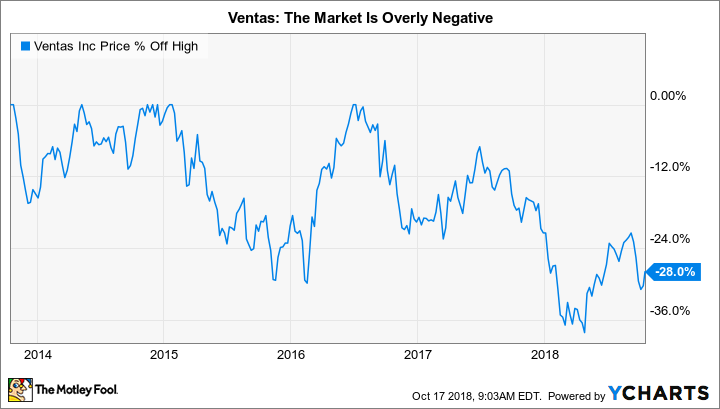 Ventas' portfolio is diversified across senior housing (around 55% of net operating income), medical office (19%), medical research (7%), acute care and rehabilitation (7%), hospital (6%), and "other," including nursing homes and loans. Senior housing is clearly the core of the REIT's business, which has been a negative lately because of oversupply. But that's a timing issue, because demand from aging baby boomers will eventually resolve the supply/demand imbalance. Meanwhile, Ventas is investing in the medical office and research spaces, both of which are seeing increasing demand right now. This is the REIT's No. 1 capital priority, with three new properties either leasing or set to open over the next couple of years. Ventas isn't just building for the sake of building, however; it is partnering with major colleges and corporations. And these three buildings have significant preleasing in place, meaning that rent will start flowing right away. Short-term headwinds in the senior housing space have left the market overly negative on this still-growing healthcare REIT, opening up a high-yield opportunity for those willing to think long term. Keith Speights (Welltower Inc.): I agree with Gregg that if you're looking for stocks with both high dividend yields and excellent long-term growth prospects, REITs with a healthcare focus are great places to start. And Welltower is a great stock to put on your list. Welltower is the biggest healthcare REIT in the U.S. Its dividend currently yields 5.2%. Welltower is on track to generate revenue of around $4.5 billion this year, delivering plenty of cash flow to cover its dividend payments. I view Welltower as a retiree's dream stock. The company's dividend is great, but so are its long-term prospects. Welltower's primary focus is on senior housing, but it also owns long-term/post-acute care (LTPAC) properties and outpatient medical facilities. Each of these areas stands to benefit from significant growth in the number of older Americans over the next two decades, especially the demographic of individuals age 85 and higher. Welltower has made a concerted effort to shift to primarily private-pay facilities in high-growth urban markets. The company now obtains 95% of its revenue from private-pay residents, up from 69% in 2010. These moves have made it more profitable as well as setting it up nicely for the future.